Will Madam Secretary be back for a fourth season? Deadline reports the odds are likely as executive producer David Grae has just signed a new deal with CBS. The political drama follows Elizabeth McCord (Tèa Leoni), the shrewd and determined Secretary of State who drives international diplomacy for the United States. The cast also includes Tim Daly, Željko Ivanek, Bebe Neuwirth, Patina Miller, Geoffrey Arend, Erich Bergen, Wallis Currie-Wood, Kathrine Herzer, and Evan Roe. 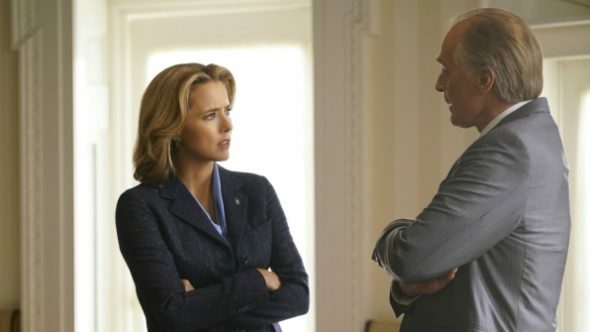 CBS has not yet announced whether they will renew Madam Secretary for a fourth season or not. Over the course of three seasons, Madam Secretary‘s ratings have dropped. So far, season three is averaging a .93 rating in the 18-49 demo and 8.476 million viewers. However, despite the low ratings, Grae’s new pact with CBS looks promising for the series. According to Deadline, the deal will see Grae continue as executive producer for Madam Secretary while he develops new projects for the network. What do you think? Do you watch Madam Secretary? Do you want a fourth season? More about: CBS TV shows: canceled or renewed?, Madam Secretary, Madam Secretary: canceled or renewed? Madam Secretary on CBS: Cancelled or Renewed for Season Five? Madam Secretary: Has the CBS TV Show Been Cancelled or Renewed for Season Four? Great show, must carry on!